Image courtesy Mrs Norma Russell. Edgar Roy Stanford was born in Orange in 1893; the eldest of five sons of Adolphus Frederic Stanford and his wife Emily Eliza Stanford (nee Morgan). “Roy”, as he was known, attended Orange Public School, where he was in the Cadet Corps for four years. The family belonged to the Holy Trinity Church congregation, where Roy sang in the choir. In his youth Roy became a proficient horserider, tennis player and marksman; he was a member of the Orange Rifle Club, the Excelsior Tennis Club and the Wade Park Tennis Club. He was also a brother of the Manchester Unity Independent Order of Oddfellows. Roy’s father was an Orange Council alderman who operated a successful business in Peisley Street as a grocer, ironmonger and produce merchant. Roy was employed as a clerk in his father’s business when he enlisted in August 1914. Upon hearing of his enlistment, the Dalton family offered Roy the pick of their stud horses to take with him to war; he chose a three year old gelding. Left Orange 12 midnight. Arrived Sydney 11.15am. Dinner in town. Waited southern troops till 5.15 then rode to Rosebery Park. Tea 9pm. All tired. The 21 year old embarked from Sydney on 20 October 1914 aboard HMAT Star of Victoria, arriving in Egypt in early December. A keen photographer, Roy took many photographs during his time in camp. Roy’s regiment left Egypt on 9 May and landed in Gallipoli on 12 May 1915. Six weeks later Roy sustained a gunshot wound to the thigh, resulting in a compound fracture of the femur. He was evacuated to No 17 General Hospital in Alexandria, where Dr Neville Howse attended to his wounds, and the decision was made to amputate his shattered leg. After a consultation by the doctors today, my own doc came and told me that I would have to have my leg off. Bad luck, but I am satisfied with his explanation. Roy was buried at Chatby War Memorial Cemetery in Egypt (now Alexandria Military and War Memorial Cemetery). He was 22 years old. Edgar Roy Stanford is commemorated on the Holy Trinity Church Orange Honour Roll. 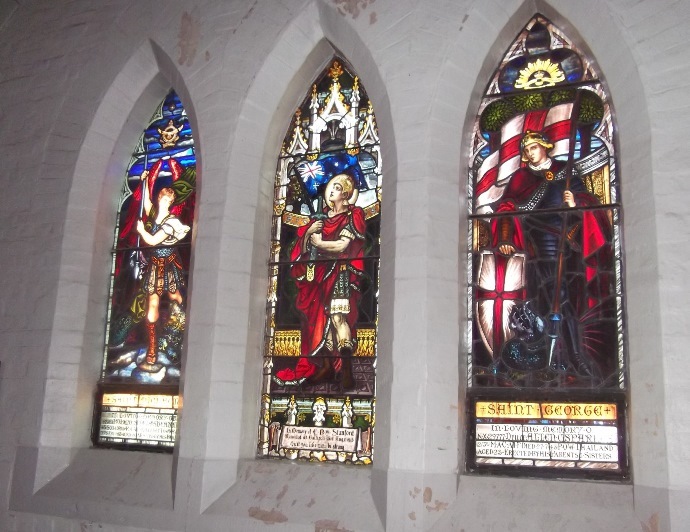 On Sunday 10 December 1916 some 1,000 people attended a service at the Holy Trinity Church during which Bishop Long unveiled a stained glass window in memory of Roy Stanford. On 25 April 1917 the second ever Anzac Day service in Orange was held at the Orange Public School. Mayoress McNeilly placed a laurel wreath on the Union Jack for each fallen soldier who had attended the school, including Roy Stanford. In July 1917 Ald. Adolphus Frederic Stanford planted a tree at Orange Public School in memory of his son. It was one of 26 trees planted in honour of fallen soldiers who had attended the school. In 1923 the Anzac Memorial Avenue of trees was planted along Bathurst Road to commemorate fallen WWI soldiers. A tree was planted in honour of “Tpr R Stanford”; it was donated by MUIOOF (Manchester Unity Independent Order of Oddfellows). Very few of the trees are still standing today. 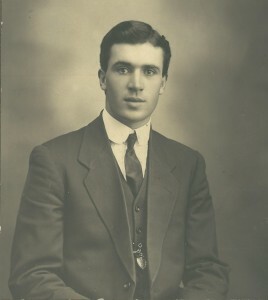 Roy’s younger brother Albert Alan Stanford also served in WWI. Private Stanford’s horse had been the envy of many a soldier, including George Tidex, who wrote to his father of his admiration for the mount. Following Roy’s death William Francis Johns took on his mount. The horse was with Johns for two years; in early 1918 it was hit in the chest by a piece of shrapnel. In 2015 Roy’s great nephew, Scott Stanford, led the Anzac Day march in Orange wearing a replica Light Horse uniform and his great uncle’s medals. Mr Stanford led his stock horse Matilda at the front of the march with a pair of boots set backwards in the stirrups as a symbol of respect and mourning for fallen soldiers. The Australian War Memorial has digitised images of Edgar’s diary, postcards and photographs. Leader, 16 August 1915, p. 1. * Harris, Janice 2015, ‘Diary describes horrors of war’, Central Western Daily, 23 April p. 6. * Stanford, Scott 2015, ‘May they live forever in our memories’, Orange City Life, 23 April 2015, p. 11. 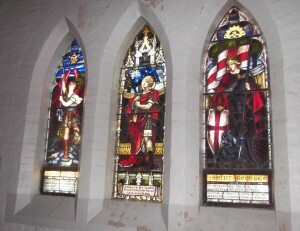 Stained glass window in memory of Roy Stanford (centre panel), Holy Trinity Church Orange. The Leader declares Orange’s Australia Day celebrations to be “An Unprecedented Success”, claiming that the day will go down in the district’s history as the greatest effort ever put forward by the large-hearted populace. The people of Orange raised in excess of £10,000 for wounded soldiers. Australia Day patriotic fundraising matchbox, 1915. Image courtesy Australian War Memorial. Assistant Director of Medical Services, Colonel Neville Howse, reports on the health of the men of the 1st Australian Division at Gallipoli, stating that the constant strain, the lack of water, and the climatic conditions, together with a type of diarrhoea that was producing anaemia, had undermined the men’s health. Thirty percent of them were unfit and the rest were not fresh and were unlikely to be able to withstand prolonged strain. Six days later these men were ordered to serve in the major August Offensive. 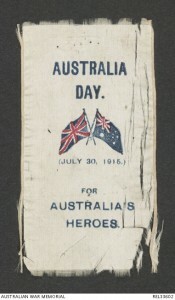 Australia Day 1915 fund raising ribbon. Image courtesy Australian War Memorial. In 1818 Governor Lachlan Macquarie acknowledged the thirtieth anniversary of the British occupation of Australia by proclaiming 26 January a public holiday in New South Wales. The day was known as ‘Foundation Day’, and each colony commemorated their founding independently. It was not until 1935 that all states and territories agreed to observe the same national day – Australia Day – on 26 January each year. 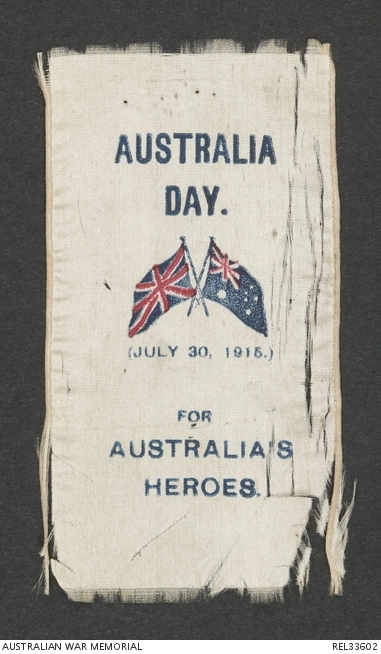 In July 1915 ‘Australia Day’ was observed as a national fundraising venture to support wounded soldiers. The concept of such a day was initiated by the mother of four servicemen, Mrs Wharton-Kirke of Manly. In June 1915 she suggested to NSW Premier, Sir Charles Wade, that such a day would draw on the nation’s pride and contribute to a growing sense of national identity. July 30 was subsequently declared as ‘Australia Day’ with a variety fundraising events including auctions, stalls, performances and street collections. £839,500 was raised in New South Wales alone, close to $1.7 million in today’s currency. The success of Australia Day in 1915 saw a repeat of similar national fundraising events for the duration of the war. In recognition of her efforts, the NSW Premier presented Mrs Wharton-Kirke with a gold medalet. It is one of only four commemorative Gallipoli medalets that were struck in solid gold. Australia Day in Orange in 1915 was celebrated over several days. Events in the week preceding 30 July included a concert and memorial service at the Australian Hall, a social evening and variety entertainment at East Orange Public School, a torchlight procession, a rugby football league benefit match and an Australian fair at the Oddfellows’ Hall. On the day school children joined military and friendly societies and numerous community groups in a huge street procession that terminated outside the Australian Hall. The Mayor then addressed the people of Orange and delivered an appeal. Throughout the day special Australia Day souvenirs and badges were on sale. Other events included a patriotic rifle match, continuous children’s concerts and a presentation of moving picture displays by the Empire Picture Company. Celebrations concluded with the presentation of the Orange Player’s Club drama, The Englishman’s Home. Sidney Alfred Maddison enlists. Sidney is commemorated on the Centenary of WWI in Orange Honour Roll; he would be killed in action in Palestine on 31 October 1917. William Robert Bulloch enlists. William is commemorated on the Centenary of WWI in Orange Honour Roll; he would be killed in action in Belgium on 5 September 1916. Turkish artillery bursting beside a pier constructed by the 1st RANBT at Suvla Bay, 1915. Image courtesy Australian War Memorial. 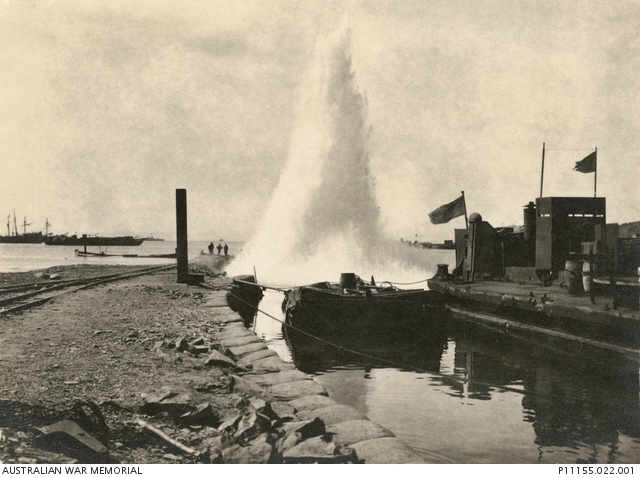 The Admiralty approves the transfer of the 1st Royal Australian Naval Bridging Train to Gallipoli. Formed in Melbourne in February 1915, the 1st RANBT was a horse drawn engineering unit attached to the Royal Naval Division serving as infantry on the Western Front. 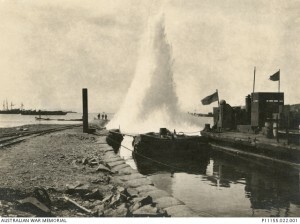 The train handled the building of jetties and berthing facilities at Gallipoli, and the unloading of stores and ammunition, freeing up soldiers for combat duties.